If a butterfly lays 100 eggs, how many do you think survive to become healthy adult butterflies? The chances are, only two can! The rest get destroyed at various stages right from the egg to adult. The environment is always full of surprises and hostile. Like any other insect species, the butterfly has to survive in the midst of drought, rain, wind and predators. In the struggle, only a few can manage to live and grow. The average life span of a butterfly is three weeks. During this brief time, the male mates with the female. The female lays the eggs. Their job is completed. The eggs hatch and the cycle goes on despite odds. For a female butterfly, the only objective is to lay eggs. After mating, it goes in search of a suitable plant. This search is important because, the larvae that will emerge from the eggs will feed only on a particular plant. The mother therefore will have to choose the right plant that will serve as food for its offspring. 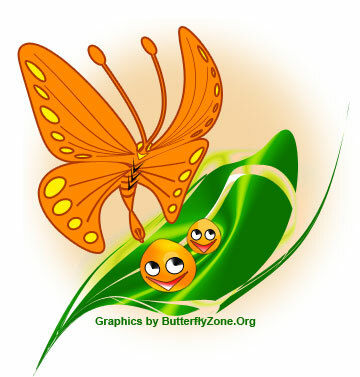 The female butterfly can recognize the food plant by its shape and color of leaves. It then alights on the leaf and strokes the leaf with its feet. The leaf is scratched and its odors are released. The butterfly smells the odors to make sure that the plant is ideal for laying the eggs. At this stage, the female has its abdomen full of eggs. The eggs develop in the ovaries of the reproductive system. Such a female is called a gravid female. The female settles on a convenient spot and begins to lay the eggs. The spot is usually the undersurface of a leaf. At the tip of the female abdomen is the ovipositor, a tubular extension of the genital opening. It facilitates egg deposition. In simple terms it is an egg laying tube. Eggs pass through this tube one by one, get fertilized by the sperm (that are received and stored in a sperm pouch during mating) and are deposited. A sticky substance flows out of the tube which enables the eggs to stick to the leaf surface. Some species of butterflies lay their eggs in groups or clusters on a plant. Others lay a single egg per plant and distribute their eggs. Both ways, the idea behind, is survival ofcourse. But in the end only two percent of them hatch and develop into adults Though this seems enough to fill our gardens with flying colors, the butterflies need to be conserved and protected . We need more of them. The task lies only in our hands.